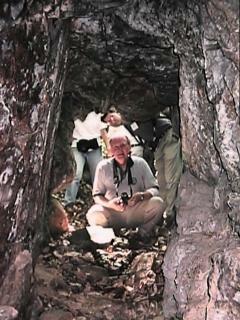 On an Eyes of Paint Branch hike in November 1998 through the wooded and rocky Paint Branch Gorge, botanist John Parrish came across an intriguing cavelike tunnel as he was scouting for rare plant species. On Saturday, June 5, 1999, some 30 environmentalists, archeologists, historians, engineers, geologists, photographers, and residents of the surrounding community took part in another Eyes of Paint Branch hike into the gorge, hoping to get a better look at the cave. The gorge is on the Federal Research Center (FRC) property in the White Oak area of Silver Spring, which is closed to the public. 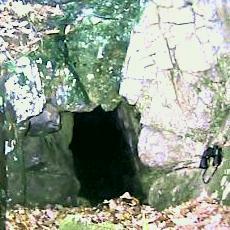 The presence of such a cave on the property had been unknown to FRC officials, and the cave does not appear on maps of the area. The two hikes were led by Bob Ridgway, environmental officer at the FRC, with special permission from the FRC. Before the cave's rediscovery, Eyes of Paint Branch (EOPB) had heard of its possible existence. James Sorensen, archeologist for the Montgomery County Parks Department, had told EOPB members of an oral history account handed down through his family. His uncle, Eugene Beall, who had played in these woods as a boy, had often told them of a cave he had seen there that had been blasted out of solid rock by a slave to earn his freedom. In other accounts the cave was said to have served as a stop on the Underground Railroad. But until recently, no one knew whether the cave still existed. In the 1930s, local teens used to plan treks to the cave, then called Devil's Den, and the nearby swimming hole, as recorded in the neighborhood newsletter, The Hillandaler. But there is no known record of the cave since then. Since the mid-1940s, the property has been a government compound, closed to the public. FRC officials had speculated that the cave may have been blasted to pieces when the sewer line was put in along the stream decades ago. The multidisciplinary group of hikers was assembled by the Eyes of Paint Branch to try to determine whether there was any truth to these oral history accounts. As the group made its way down into the gorge, historian Anthony M. Cohen, noted authority on the Underground Railroad and director of the Menare Foundation, Inc., commented that "When trying to solve a mystery from the past, it is always good to get a variety of viewpoints." The cave was hidden from view until the group was literally on top of it. There were two entrances into the rock, about 30 to 35 feet apart across a saddle between two ridges, making the feature more like a tunnel than a cave. The larger entrance was perhaps 5 feet high, and the smaller, perhaps 4 feet. 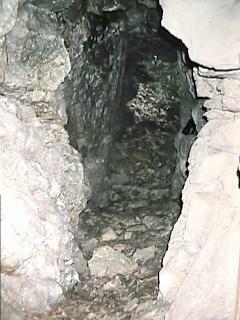 A rock-walled chute extended from each end, making the entire length of the feature about 60 feet. The rock appeared to be layered schist. Vulture feathers scattered about indicated recent nesting activity, and Sorensen remembered stories from his uncle of snakes in the cave. Geologist Lewis Kozlosky remarked that "you wouldn't expect to see anything like this occurring naturally in this type of bedrock." He added that the rock is known as the Wissahickon schist. (The Wissahickon schist is a Precambrian metamorphic rock over 600 million years old.) The area of Devil's Den is on the "fall line," where the Piedmont Plateau drops down to the Coastal Plain. The resulting drop in elevation provides fast-moving water in the streams that cross the fall line, which is why so many mills were built along it. Several 1-inch-diameter holes in the rock were discovered and photographed. Kozlosky said these are "irrefutable evidence of blasting." Archeologist Steve Israel said that the person who made the tunnel used iron tools and black powder. Israel said that the holes would have been hand-drilled and then the powder tamped in. Determining why the tunnel had been made required the help of engineer Richard Stowe and his wife Eileen Finnegan, editor of The Hillandaler. Finnegan had been intrigued by the references to the Devil's Den in old issues of the newsletter and had recently located a detailed reference to the cave in a 1914 article by "The Rambler," J. Harry Shannon, in the Washington Star. The Rambler wrote a regular column on his walks in the wilderness surrounding the nation's capital, and one long report focused on the Paint Branch valley. He wrote, The account given on the spot to the Rambler concerning the origin of this hand-hewed tunnel called the Devil's Den was this: "It was designed to erect a mill there, and the millrace [the canal through which the water flows to power the mill] to be most effective would have to pass through the rock wall or rock mass. The man who meant to build the mill had slaves and to one very handy and able man he offered freedom if he would cut a tunnel through the rock." "The slave labored with a sledge, drill, gunpowder, and fuse for many months. Before the task was done slavery in Maryland was abolished, but the tunnel cutting man kept at his work till the rock was drilled." Stowe told the group that "Looking at the lay of the land as an engineer, I'm convinced that the tunnel is a mill race, which is consistent with the stories that Shannon heard in 1914." He showed the group where the dam and the pond would have been. He added, "my personal thinking is that the reason it was cut through rock was to carry a good velocity of water, which would not have been possible with a surface mill race. This velocity could have powered one of the new turbines that were just beginning to be used [instead of the wheel-type mills]. If the Rambler's story is correct, that would closely date the tunnel's construction to around 1860 to 1870, which was when the mills up in Delaware had been converted to turbines. Otherwise, there would have been no reason to have a tunnel rather than the usual open race." But although the tunnel was completed, the mill may have remained a dream. According to Sorensen, "there is no sign of a structure on the side where the mill would have been." But he theorized that perhaps a flume had carried the water across the stream to Mrs. Harper's Woolen Mill, a well-documented nearby mill. He added that he had recently discovered that according to the 1850 Census Mrs. Harper had owned one male slave. Two other mills in Montgomery County are known to have been built with a flume across the stream, one of them being the Valley Mill, which had been situated upstream on the Paint Branch. For now the timing of the building of the tunnel will remain part of the mystery, as will the story of the man who built it. One of the neighbors on the hike, Gary Irby, described a visit from an old man from California who knocked on his door several years ago. He was visiting the area where he grew up, and he told Irby that he used to play with the children in a family who lived "at the top of the hill" and who were descendants of the man who built Devil's Den. The mystery of whether there is an Underground Railroad connection also remains. When asked about the likelihood of such a connection, Cohen said, "The Underground Railroad doesn't give you its secrets all of the time. There may be a connection, and there may not be. But there's a story here, and the question is, why does it persist?" He added that one factor in favor of the connection, in addition to the oral history accounts, is that the site is on a stream. Stream valleys provided the only good cover in those days, when most of the land had been cleared for agriculture. And documented Underground Railroad sites exist further downstream. There were organized mill settlements nearby, and that fact could also argue for a connection. But until further documentation is found, Cohen said, "it is impossible to say." Nevertheless, as Cohen worked his way through the tunnel, he turned and, with a touch of excitement in his voice, told a companion, "This would have been an ideal hiding place for the Underground Railroad."